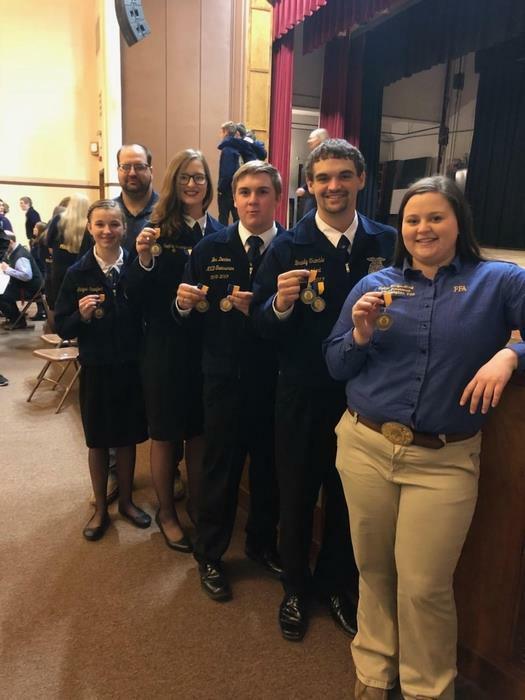 Job-Hunt.org states that the most common interview question is “ Tell me about yourself.” Members of the FFA chapter partook in Job Interview and Speech Competition. Participants put in many hours of practice and it showed. The competition was held Wednesday January 16th, at Marysville High School. All the members who competed in the competitions had been practicing for this event since the beginning of December. The members even came in on the weekends and early in the mornings. “ This competition helps build life long skills that they can use anytime when they are trying to get a job” said Drew Obermeyer. In Job Interview: A division Brady Trimble won 1st and Wesley Denton got 3rd. In the B, division Rylie Borgerding placed 1st and Sophie Brungardt placed 3rd. In speech competition Wesley Denton placed 1st. In Sophomore speech completion Abigail Steinfort got 4th. “I really enjoy this competition because not only does it help us become better speakers, but it helps us prepare for our future at the same time” said Rylie Borgerding, Jr.